Thursday night saw Vélez Sarsfield as the last Argentine club standing in the 2011 Copa Libertadores. The Liniers side got a highly impressive 2-0 win away to Liga de Quito to complete a 5-0 aggregate win over the 2008 champions, whilst Estudiantes – Copa winners in 2009 – went out to Paraguay’s Cerro Porteño 5-3 on penalties in Asunción, after a 0-0 aggregate draw (Argentine Javier Villarreal scored the winning penalty in the shootout). This leaves Vélez as the only Argentine side in the quarter-finals, just a day after all but one of Brazil’s representatives were also eliminated (Santos are the only brazucas left standing). You can see videos of both Vélez’s and Estudiantes’ games right here. 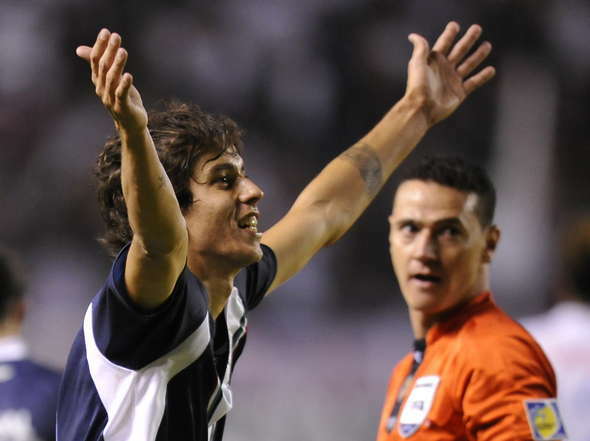 Vélez’s goals were scored by ‘Ricky’ Álvarez ten minutes into stoppage time at the end of the first half (a floodlight failure had caused the game to be delayed midway through the first period), and Iván Bella in the 80th minute. They’ll meet Libertad of Paraguay in the quarter-finals, with the first leg to be played in Liniers on Wednesday of next week, and the second in Asunción on the following Wednesday. In the other quarter-final ties, with the side at home in the first leg listed first, Once Caldas of Colombia host Brazil’s sole remaining side Santos, Uruguayan giants Peñarol take on Chile’s Universidad Católica, and Jaguares de Chiapas of Mexico play Estudiantes’ conquerors, Cerro Porteño. Just TWO sides from Brazil and Argentina in the Q/F’s?! Only in the Copa Libertadores! Fantastic stuff. Yes. A sad day when the champs de la Plata were knocked out.